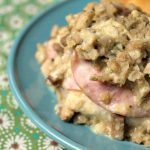 If you are looking for a really flavorful yet super simple recipe for dinner then I urge you to give this recipe for Chicken Cordon Bleu made in the slow cooker a try. It was a HUGE hit with the family and I was told by all to put this in the “cook again” recipe file. The only thing I would have done differently in this recipe is use smaller chicken breasts. The ones I used were HUGE and were a bit much to eat. If you look at the picture you can see that these were some big chicken breasts! I know that many people shirk at recipes that call for “cream of” soups, but I find that there are times that it is worth using them. Chicken is one of those meats that just does not get more tender the more you cook it in the crock-pot. It just gets drier. The key to cooking chicken in the crock-pot is to cook it with liquid, and this cream of chicken soup & milk mixture does the trick there, and then make sure you don’t overcook your chicken. I would check chicken at the lower point of the time range given and only cook longer if your chicken is not cooked through. But it really should be. This delicious recipe is perfect for dinner any night of the week. The flavors are fantastic and this chicken recipe is perfect for Sunday dinner! In a bowl whisk together the cream of chicken soup and milk until combined. Pour half of the soup and milk mixture in the bottom of a 6 to 7 quart oval slow cooker. Arrange chicken breasts on top of the soup mixture. Lay slices of ham and then slices of Swiss cheese over the top of the chicken breasts. Pour remaining soup & milk mixture over everything. 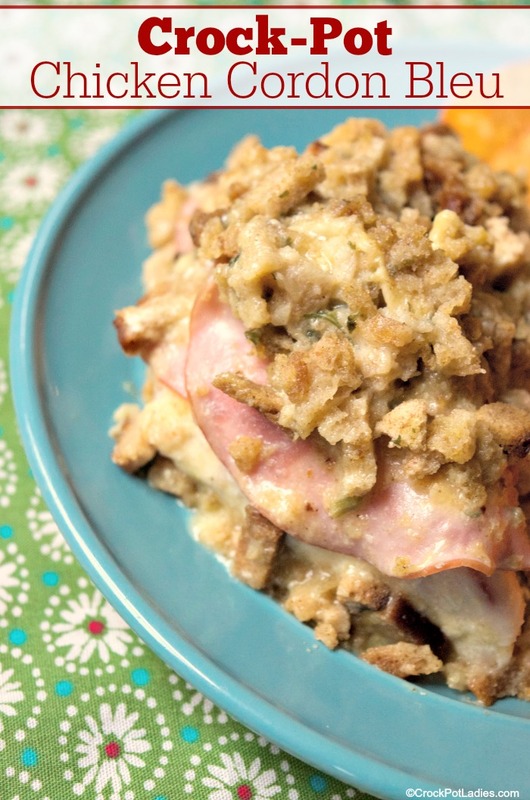 Cover top of chicken, ham & Swiss cheese with the dry stuffing mix. Pour melted butter and water over the top of the dry stuffing mix. Cover and cook on LOW for 4 to 6 hours or on HIGH for 2 to 3 hours. Because I used very large chicken breasts I only used 4. But if you were using smaller breasts you can easily use 6. You might also want to try this with chicken tenderloins. Serve with your favorite vegetable, a side of some nice crusty French bread and you have dinner on the table! Weight Watchers SmartPoints calculated using Campbell's Healthy Request cream of chicken soup, low-fat Swiss cheese and fat-free skim milk. This looks scrumptuous and so easy. I’ll be doing it in my solar oven, before long. Crock pot cooking is so easily transferred to the solar oven and you have such wonderful recipes. Thanks for sharing. Come visit when you can. I made this Sunday for lunch. It was Fabulous!!!!!!!!! That is Awesome Bambi, thanks for letting us know how much you enjoyed this recipe! If I needed it to be in longer because of work schedule, would it be ok? More like 9 hours on low? If your slow cooker is programmable and automatically flips to the warm setting after cooking this should keep OK for several hours on WARM after it is cooked. You may also want to try using chicken thighs instead of breasts as they can cook for a longer time without drying out the way chicken breasts can. Made last night for dinner. Was so good. Can’t wait to eat leftovers for lunch today. Thanks! So glad you enjoyed this recipe Michelle! What changes would you make for using frozen chicken breasts? Longer cooking time? I have not made this recipe with frozen chicken breasts but I am pretty sure it would be OK. I would cook maybe 30-60 minutes longer to allow for the frozen chicken. Let us know how it turns out for you Emma! I tried this today with frozen chicken breasts. It’s been on low for about 4 hours and is already up to temp! Just thought I would share for those that want to do it with frozen. I made this last night. It was likely the tastiest dish to ever come out of my crock pot. Thank you! Awesome Caleb, I am thrilled you enjoyed it! Made this tonight! So awesome! It’s a keeper! Happy you enjoyed the recipe Marlisa! Would this work as well in a slow cooker as in a crock pot? I made this Saturday night and thought my fiance was skeptical about the stuffing mix part of it, he LOVED it. Thank you! I tried a similar recipe but it calle for cubed ham. 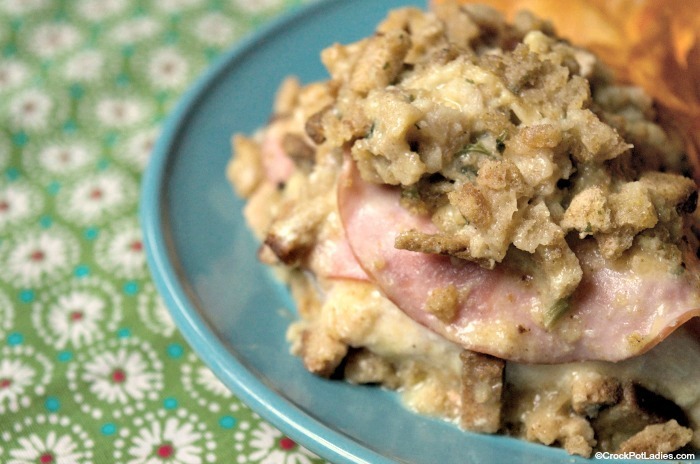 I think sliced would work MUCH better and love the idea of adding stuffing. What type of honey ham would you use for this recipe? From the deli counter? and how many pounds should I buy of the ham? And how many pounds of cheese. Thanks so much! You can buy your ham at the deli counter or even just packages of it in the deli section of the store. The recipe calls for 4 oz. of ham and 4 oz of cheese. So you don’t need pounds of it. Just 4 oz. This looks so easy and delicious! This is whats for dinner tomorrow. I really enjoy crock pot recipes as it makes dinner time much easier. Thank you for sharing and all of the positive comments! I made this for supper and we thought it was pretty good. I cooked it on high, and during the third hour of cooking, it went from not done to overcooked. I would make this again, but I think I’d do it on low. Thank you for the great idea! So glad you enjoyed this recipe Don! Keep on truckin! I think I am going to have to research some truck driver recipes for you hard working men and women who keep this nation going! Has anyone made this subbing in leftover shredded chicken? I’m going to try it today with rotisserie leftovers. I have to prepare a meal for a large group of people (50-60) and do not have enough crockpots.. Can you tell me how to adjust this recipe for the oven? I would probably bake at 350 degrees for about 45 minutes to 1 hour (for these exact measurements of ingredients). If you are adjusting the recipe to feed more then you would need to adjust the cooking time. I don’t like stuffing mix. Thought I might try crushed Ritz Crackers, instead. If you try Ritz crackers instead of the stuffing mix be sure to come on back and let us know how it turns out for you Lisa!